Pelletizing is a process that involves mixing very finely ground particles of iron ore fines of size less than 200 mesh with additives like bentonite and then shaping them into oval/spherical lumps of 8-20 mm in diameter by a pelletizer and hardening the balls by firing with a fuel. It is the process of converting iron ore fines into ‘uniformed sized iron ore pellets’ that can be charged directly into a blast furnace. 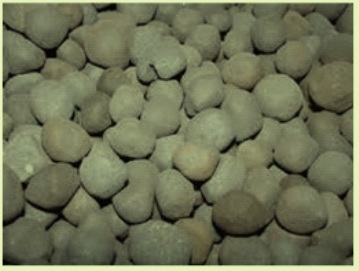 Fig 1 shows iron ore pellets. There are several iron ore pelletizing processes/technologies available. However, currently, straight traveling grate (STG) process and grate kiln (GK) process are more popular processes. The physical properties of iron ore pellets are given below. The chemical analysis of iron ore pellets is given below. Quality of the pellets is influenced by the nature of the ore or concentrate, associated gangue, type and amount of fluxes added. These factors in turn result in the variation of physicochemical properties of the coexisting phases and their distribution during the pellet induration. Hence properties of the pellets are largely governed by the form and degree of bonding achieved between the ore particles and the stability of these bonding phases during reduction of iron oxides in the blast furnace. Since the formation of phases and micro structure during induration depends on the type and amount of fluxes added, there is an effect of fluxing agents in terms of CaO/SiO2 ratio and MgO content on the pellet quality. The history of pellets began in 1912 when A.G. Andersson, a Swede, invented a pelletizing method. The commercial use of pellets, however, began in the USA after World War 2. Various studies were conducted with the aim of developing the vast reserves of taconite in the area around the Great Lakes. In 1943, Dr. Davis, a professor at the University of Minnesota, Mines Experiment Station, invented a method for processing taconite containing low grade iron ore. His process involved grinding taconite to remove gangues and upgrading the iron ore (i.e., an ore beneficiation process). The resultant high grade ore is in the form of fine particles, as small as 0.1 mm or less, which are not suitable for sintering. This issue led to the development of pelletizing of these fine particles. Pelletizing plants today play an important role in an era when the global reserve of high grade lump ore is shrinking. The plants promote the concentrating of low grade ore into upgraded pellets, which are increasingly being used by blast furnaces and direct reduction furnaces. The US iron making has historically been based to a large extent on pellets primarily because all the local iron ores needed beneficiation (up grading) by grinding it to fine particles (< 0.1 mm) and agglomerating these fines into pellets but also because sinter plants are not used due to environmental reasons. In the mid 1980s, a number of pelletizing and blast furnace trials were conducted to evaluate the benefits of limestone dolomite fluxed pellets. Towards the end of the decade, fluxed pellets had been firmly established as a major product, accounting for about 30 % of North America’s pellet production. The transition to fluxed pellets involved many changes in plant equipment (e.g., flux grinding mills, pre-heat burners) and practices. Each pellet plant has customized the fluxed pellet chemistry to meet its customer’s blast furnace operation. As a result, there are pellet plants producing as many as four grades of pellets. In North America, pellets have changed from a commodity in the early 1970s to a custom made product, meeting a customer’s specific most demanding specifications in the 1990s. North American fluxed pellets are now equivalent to the best sinter in terms of reducibility and softening meltdown properties and are superior in terms of strength and low temperature breakdown (LTD/RDI). Iron ore pellet can be used as a substitute to sinter and calibrated lump ore in the blast furnace burden due to the following properties. Spherical shape and open pores of pellets gives better and uniform permeability resulting in smoother furnace operation. Pellets have a uniform size range generally within a range of 8 – 20 mm. Pellets have very high cold crushing strength resulting in negligible generation of fines in stock house. High strength of pellet (around 250 daN/p ) provides good resistance to disintegration during the descent of burden. It has better tumbling index when compared with the calibrated iron ore. Uniform chemical composition compared to calibrated lump ore. Absence of LOI is another advantage of the pellets. The swelling index of pellets is an Important of metallurgical property. Swelling indicates volume change of pellets during reduction. The volume expansion of pellets during the reduction results in lower compressive strength of pellets. High swelling inside the furnace causes increase in volume of the pallet which in turn decreases voids in charge. This Impedes gas flow in the furnace and results into pressure drop. This in turn causes burden hanging and slipping inside the blast furnace. The addition of dolomite is favorable for the improvement in swelling property of pellets. Maximum allowable swelling of pellets for the blast furnace ranges from 16 % to 18 %. Acid pellets (DRI pellets) and MgO free pellets exhibit higher swelling. Fluxed pellets can be produced as equivalent to the best sinter in terms of reducibility and softening meltdown properties and are superior in terms of strength and low temperature breakdown (LTD/RDI). Fluxed pellets exhibit good strength, improved reducibility, swelling and softening melting characteristics. Because of these properties fluxed pellets give better performance in the blast furnace. Sinter, pellet and the calibrated lump ores are the three iron bearing metallics normally used in the blast furnace burden. Uses of all the three metallics in blast furnace burden can vary from zero to hundred percent with adjustment of the furnace parameters. These three metallics can be used in any combination of two metallics or three metallics. There is no standard formula for the choice of metallics. The choice of metallics depends on several factors varying from plant to plant. Some of the factors influencing the choice of metallics are given below. Possibility of adjustment of various furnace parameters such as distribution pattern, fuel rate etc. Pellets in blast furnace can be used from 0 % to 100 %. There is no standard solution for increasing the pellet content in the blast furnace burden. Every location and each furnace will have different issues which need to be identified, analyzed and solutions are to be found for to arrive at the maximum amount of the pellet content which can be used in the BF burden. The objective should always be to have trouble free blast furnace operation at the lowest possible cost of production for the hot metal.